The SA Museum’s 30,000 ethnographic indigenous objects are one of the most comprehensive collections of Australian Aboriginal cultural artefacts in the world. Some of these artefacts are thousands of years old, surviving colonisation and the changing Australian environment. 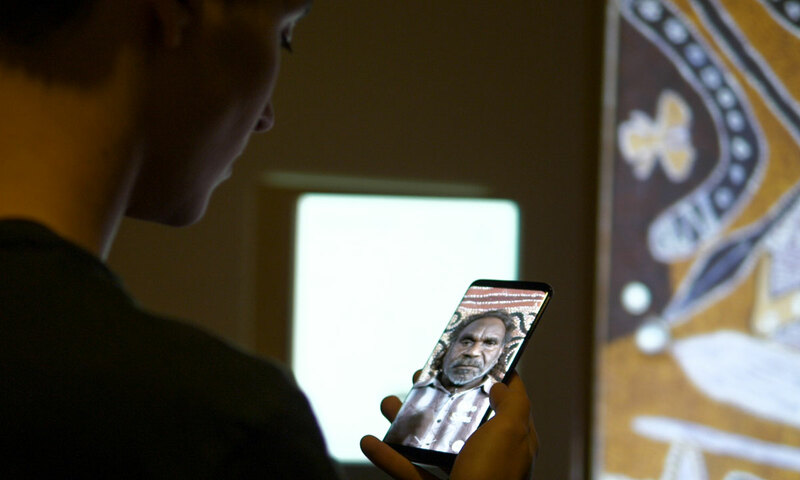 This is where Cipher – an audience-based audio-visual program designed by South Australian company Sandpit – comes into play by giving museum visitors virtual access to parts of the collection on display via their smartphones. “Cipher is a new way to explore these artworks and connect to the stories that sit underneath them,” says Sandpit director Sam Haren. The first artefacts to be displayed through Cipher from next month are a collection called the Yuendumu School Doors. The 27 wooden doors, which were already digitised, are adorned with Aboriginal Dreaming designs painted by members from the Northern Territory Yuendumu community, and are landmark artefacts for the museum. “Your phone becomes a bit like a pointer or a cursor where you can point it at the door and you can scroll over it,” he says. Sandpit has previously worked with a number of leading institutions on visitor platforms, including the Australian Centre for the Moving Image (ACMI), University of Adelaide and Arts Centre Melbourne. Haren says their experience with these institutions convinced them that the Cipher platform would be suitable for museums and galleries around the world, particularly where exhibition space is limited. “We’ve discovered some core problems many museums and galleries try to tackle. The first is that the collections that they hold of objects or artworks are physically a lot bigger than the space that they have to exhibit them. The relationship between the South Australian Museum and Sandpit started when the company won the IgniteSA Preserve challenge in July last year. The challenge required local developers, entrepreneurs, students and other creative minds to create a concept that gives the museum’s Australian Aboriginal Culture Collection high visibility. South Australia has also joined the US Ignite Smart Gigabit Communities program – an initiative that benefits international communities by sharing digitised collections of artefacts. SA Museum director Brian Oldman is excited about what this project will do for the space. “What [this] technology actually allows you to have access to is to those objects that at the moment are not on public display,” Oldman says. Oldman says the Yuendumu community is happy about the representation of the Doors and the way in which their unique story is being told. The Yuendumu School Doors were painted in the early 1980s by five senior men from the Warlpiri community. These artists were invited into the Yuendumu school to paint their Dreaming stories onto the doors of classrooms with acrylic paint. At the time, Yuendumu School Doors were a gesture symbolising a new era of two-way education. “This technology means that we can communicate these stories far more effectively, far more clearly, and also we can use the expert knowledge of the cultural custodians who live in that area,” says Oldman.